I'm crazy about Starbucks' pumpkin bread. It's so dense and delicious! I searched for a recipe and tinkered with this one to come up with something so close I call it, Knockoff Starbucks Pumpkin-Bread. 1. Preheat oven to 325 degrees F. Grease and flour bundt pan. 2. In large mixing bowl, combine sugar, eggs and oil; beat until smooth. Add water and beat until blended. Stir in pumpkin, ginger, cinnamon, allspice, and cloves. 3. In medium bowl combine flour, baking soda, salt and baking powder. Add dry ingredients to pumpkin mixture and blend just until it's all mixed. Pour batter in prepared pan. 4. Bake in preheated oven until knife comes out clean, about 1 - 1 1/2 hours. Yep, most definitely butter. I can smell it in my oven now! Thanks for the recipe, Catherine! Yum! I love the spicy sound of this recipe. thx for sharing. Love pumpkin bread! Can't wait until I try this recipe. Thanks for sharing! Yum! Thanks so much for stopping by my blog and leaving the lovely comment! 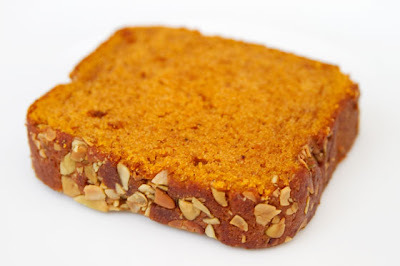 I ADORE pumpkin bread! YUM. Mmm. Now I want pumpkin bread.